Silence on the radio tonight feels just like the first time out here on my own. “Youth may be in their blood, but tradition guides their instincts”, reveals M! Music and Musician’s Magazine, “The Dirty Guv’nahs are wise in the ways of rock n’ roll beyond their tender years”. The swell of grassroots momentum for this 6-piece rock n’ roll collective from Knoxville, TN is undeniable. “The Guvs” have been steadily growing their fan base across the country, selling out shows in theatres and bars alike, and making standout festival appearances at Bonnaroo, Wakarusa, and SXSW, to name a few. The band has also shared the stage with a diverse and notable list of major artists, including Wilco, Zac Brown Band, Levon Helm Band, Grace Potter and the Nocturnals, Train, Dr. Dog, and Chris Robinson. After two independent releases and relentless touring, The Dirty Guv’nahs’ new album, Somewhere Beneath These Southern Skies (Dualtone Music) raises the bar significantly for this explosive ensemble. Somewhere Beneath These Southern Skies was recorded in Nashville, TN with producer Ross Copperman and Grammy winning engineer Richie Biggs (The Civil Wars). Somewhere Beneath These Southern Skies marks another successful milestone for The Guvs, showcasing an energetic blend of rock and soul interwoven with a distinctive modern edge. The result is a joyous 14-track offering that combines honest, heartfelt lyrics with gritty and passionate musicianship. Standout tracks “3,000 Miles”, “Don’t Give Up on Me”, and “Temptation” exemplify the band’s keen ability to effectively infuse traditional rock sounds with contemporary relevancy. Upbeat foot-stompers like “Good Luck Charm” and “Can You Feel It” conjure the familiar American rock feel that The Dirty Guv’nahs began fashioning on their 2010 Release Youth Is In Our Blood. The Dirty Guv’nahs’ unlikely genesis took place when band members were introduced through a mutual friend, nicknamed “The Guv’nah”, who eventually became the band’s namesake. Their following grew quickly and after a string of sellout shows in their hometown of Knoxville, Tennessee, they were offered their first performance slot at Bonnaroo. That concert led to a recording opportunity in December of 2009 at roots-rock mecca Levon Helm Studios, and the band hasn’t looked back since. The Dirty Guv’nahs’ live show is led by the soulful holler of frenetic front man James Trimble. Brothers Justin and Aaron Hoskins lay down a sturdy foundation of tight rhythms on bass and drums (respectively), while Chris Doody’s thick Hammond organ and bluesy piano along with Michael Jenkins’ and Cozmo Holloway’s tasty guitar stylings round out the group’s sound. The result is accurately described by a recent review in Music Connection Magazine: “The Dirty Guv’nahs don’t just play music; they capture the human experience through song.” Relix Magazine was so impressed with The Guv’s live show; they recently made the group one of their “On the Verge” artists for March 2012. Upon witnessing the band’s blue-collar approach, they commented, “Musicians today that don’t want to connect with their fans are just missing the whole point. 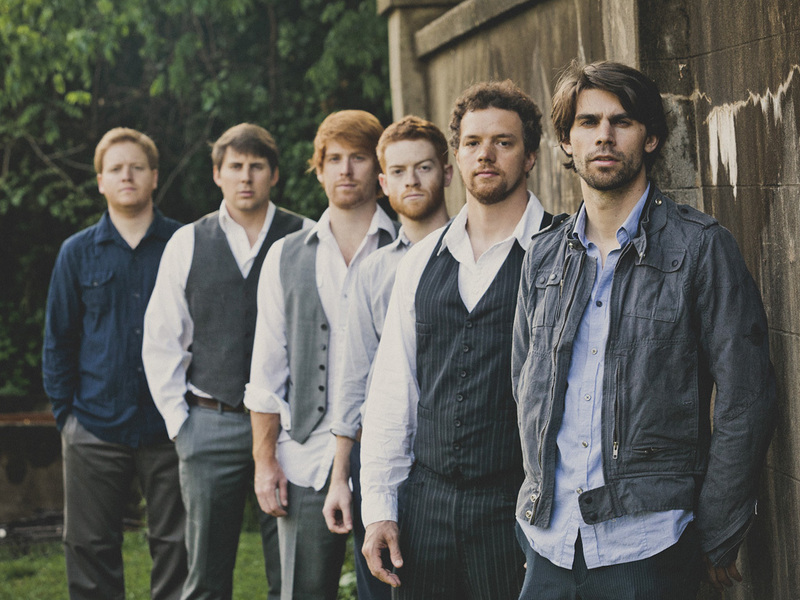 The Dirty Guv’nahs are grassroots all the way.” The Guvs grassroots success story received its most recent validation when the band funded their new album entirely through Kickstarter donations from fans. The band raised 100% of their target funding in 3 days, prompting recognition of the Guv’nahs campaign in Billboard Magazine, and went to work creating an album that is sure to stir the hearts and shuffle the feet of their organic fan base. Somewhere Beneath These Southern Skies is a riveting collection of songs for a new generation of listeners starving for a fresh and authentic rock n’ roll music experience.